Living in the 21st-century global pantheon means we live alongside unprecedented existential risks, which can come from above and below, from outside and from within. Scientists, scholars, policymakers, defense strategists, risk analysts and experts in nearly every field have been organizing themselves around the issue of looming catastrophe. In this spirit, let’s take a clear-headed look at the nuclear, chemical, biological, and ecological perils that might befall us in the not-too-distant future. The cover of The Boston Globe’s Business Section recently described think tanks devoted to predicting technological doomsday scenarios that might close out the Anthropocene. They included the Pardee Center for the Study for the Longer-Range Future at Boston University, which looks at global climate change, and the Future of Life Institute—funded in part by Elon Musk—which focuses on nuclear weaponization, biotechnology, and military AI. The Global Catastrophe Risk Institute, based in cities around the world, is comprised of a worldwide network of scholars and risk analysts thinking through threats to human civilization. of the world’s premier AI researchers and scientists signed a letter, drafted by FLI, that urged for an international ban on efficient autonomous weapons. Such weapons could qualify as their own category of WMDs, unsettle global stability, and lead to an all-out arms race. Another group, The Future Society at Harvard Kennedy School, hopes to explore technology's immediate impact on existing social contracts. There's no innovation that can't be politicized, something to remember as biotechnology, nanotechnology, information technology and cognitive science continue to alter the fundamentals of our brains, bodies, devices and environs. Speaking to Hopes&Fears, Patrick Daniel, its co-founder, is tempered in his predictions: "Like the Chinese word for 'crisis' (weiji), technology has a dual meaning: it represents both risk and opportunity. While it will solve many problems and offer extraordinary growth, at the same time, we must also acknowledge its dangers." As a society, Daniel adds, "we need to strike a balance, being neither fearful of the risks nor greedy about the opportunities." Naturally, scholars are more concerned about the risks. The past few decades have seen a rise in the number of nuclear weapons states, and today, Francesca Giovannini, a specialist in global security and international affairs, tells Hopes&Fears, "the international community is facing severe challenges. The globalization of terrorism, the resurgence of geopolitical rivalries, and the intensification of economic shocks in the most vulnerable countries are all simultaneously affecting global peace and security. Most pressing of all, however, is the enduring presence of nuclear weapons—and the rapid and worrisome weakening of the global nuclear order." Add to this that the single biggest threat to our survival may come not from a one-off nuclear or ecological event, but as one anonymous diplomacy and defense strategist speculates, as a slow process of collective mental colonization (think: painless apparatuses that have the capability to infiltrate our networked bodies and minds virtually undetected). The increased prostheticization and device-dependence of human beings leaves us increasingly open to civilian attacks by rogue cyber-hacking collectives or state-sponsored entities. Narratives of the future are often framed in terms of mass destruction. In his recent piece on post-apocalyptic simplification, Ben Woodard argues that contemporary thought has a "general lack of a concept of futurity, of any sense of a future that is not totalitarian [or] structurally disastrous." Such projections, usually split between nuclear war and technological dystopia, reflect an "odd combination of preparatory eschatology and a total removal from the political or environmental present." These imagined futurescapes allow for a disconnect, Woodard concludes, that favor fantasies in which heroes save civilization and worlds in which we can start anew, purged of the geopolitical imbroglio we’re potentially in. But this hero-and-villain dichotomy can't possibly capture an atomic missile deployed from space, an exploding glacier lake, or a pathogenic virus released into the general population. These scenarios would be brought about by a complicated mesh of converging political, cultural and economic factors in which there is no single salvation or solution. Patrick is a co-founder of The Future Society at Harvard Kennedy School. His work is centered on gaining a historical understanding of turning points and dynamics of change in society, markets, and individuals, particularly in emerging African economies. He has worked for historian Niall Ferguson, researching macroeconomic and geopolitical issues. He is also a regular contributor to The Huffington Post. Francesca is Senior Program Officer for Global Security and International Affairs at the American Academy of Arts and Sciences, an affiliate of the Center for International Security and Cooperation (CISAC), Stanford University, and an associate of the Project on Managing the Atom at the Belfer Center for Science and International Affairs, Harvard University. Her research considers emerging threats to global peace and security in the 21st century. She is responsible for implementing the Global Nuclear Future Initiative (GNF), a multi-year, multi-donor effort, which works to build regional capacities for effective nuclear governance in Southeast Asia and the Middle East. 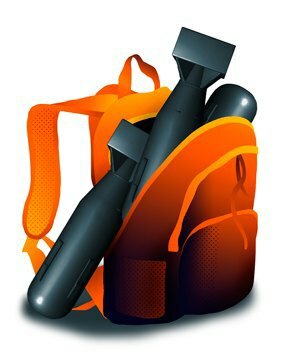 Nuclear, chemical, biological, radiological and explosive weapons are considered the major categories of WMDs. Of all these, it is perhaps the first that's most inscribed in our collective consciousness thanks to the news and movie industries. The scene Giovannini describes is sobering: there are an estimated 16,732 nuclear weapons in the world, distributed among nine countries. About 90% of these are in the United States and Russia alone. "The global nuclear order today rests in a precarious balance; chances of accidental launch owing to a miscommunication or misperception are heightened," she says. Experts say that in the next 70 years, either an accident or attack to a nuclear facility are likely scenarios. Complicating the situation, the "nuclear institutions, which once were created to advance the cause of nuclear reduction, have faced severe paralysis," Giovannini adds. "The Conference on Disarmament (CD) has been, de facto, in an institutional stalemate for over 30 years. The media remains silent on this topic, but it is indispensable that we begin a new conversation on nuclear weapons, and raise awareness, particularly among young people." A nuclear warhead is typically a fission bomb, inside of which a super-dense mass of plutonium or uranium is concentrated. Fission weapons are the only type to be used in warfare. There is a fusion, or hydrogen, bomb, which is difficult to create and deploy (only a few countries have been able to detonate one with any success). A neutron bomb has the insidious quality of eliminating human life while, in many cases, leaving property intact. A boosted fission weapon uses some fusion fuel to increase the fission reaction's rate and yield. A developed industrial nation with appropriate infrastructure can build thermonuclear arms. Providing an alternative to the Cold War era's high-yield "strategic" nuclear weapons are today's lower-yield "tactical" variants, which have changed the landscape considerably. Medium-grade radiological weapons also make the list. Other than the United States and Russia, China, Pakistan, Israel, India France, the United Kingdom, North Korea and even South Africa are all known to have nuclear arsenals. The varying degrees of development among these countries, along with the ever changing face—or facelessness—of terrorism, are causes for concern. There is a real fear of "loose nukes," or Soviet Union-era bombs sold on the black market. In short, the less stable the government, the more tenuous the peace. There's also the attendant issue of peaceful nuclear energy use: nuclear reactors are either already present or rapidly being built in India, China, Russia, South Korea and the UAE, along with over a dozen other countries. Iran's nuclear program, of course, is subject of intense speculation. In the future, important fields will include the monitoring of emergent civilian nuclear programs and the push toward international management of fissile material use. That the U.S. and Russia are renewing their rivalry is "worrisome," says Giovannini. She points out that "cooperation and dialogue between the two countries on critical issues, including nuclear weapons, has been suspended, along with the prospect for further arms control negotiations in the future." Further, that the 2015 review conference of the Non-Proliferation of Nuclear Weapons Treaty (NPT) "closed without even a consensus statement … reveals deepening differences among various nuclear groups on issues related to non-proliferation and the rights of countries to access nuclear technology for peaceful use." States without nuclear capability see an "enduring injustice within the treaty," a conflict between the weaponized haves and have-nots; they perceive a basic "unwillingness of nuclear weapons states to reduce and dismantle their nuclear arsenal," which contributes to a deepening of the rift. Asked about the nuclear future, the anoymous source offered some hopeful, possibly reassuring insights. "There are a tremendous amount of people and resources to keep those genies in a bottle," the source said, expressing confidence that new technological evolutions, such as ballistic missile defenses that are able to track and destroy weapons, "will only get better." Nuclear terrorism has "profound consequences for the aggressor," after all. If a terrorist group were to detonate a device to render downtown Manhattan unliveable for the next 50 or 60 years, the responsible party would experience "incredibly severe consequences." The impasses of mutually-assured destruction that have helped in practicing restraint so far may just continue to hold. Chemical warfare agents—nerve, blister, blood, pulmonary and nettle—come in many forms: as gaseous vapors, aerosol sprays, or liquid spills. Lewisite, Ricin, Mustard Gas, Sarin, Phosgene, Chlorine and Malathion are just some of the most recognizable names on the list. Some of these substances are so lethal, even in trace quantities, that many countries have a strict ban on their production. Sarin is perhaps the most infamous: an odorless colorless nerve agent, it causes death within minutes. It was used in the infamous Aum Shinriko attack in Japan in 1994, in the Tokyo subway a year later, and most recently in the Syrian civil war (attacks during which, it is estimated, anywhere between 300 and 1,700 people died). The use of chemical weapons is usually discussed as a potential tool of terrorism, but talk of it is relatively absent from the U.S. policy scene. Turns out, it's extremely hard to scale a chemical attack into mass-casualty. However, the chemical industry’s globalization and the current nature of asymmetric, decentralized warfare may change this fact. Chemical agents are said to be present in North Korea, Israel, Egypt, Burma, China, and of course, Syria. Nervous intrigue swirls around Russia's production of Novichoks, a line of compounds that can be concealed in commercial chemical plants without detection. Plants themselves are at risk, as security personnel are not always impermeable. Hazmat incidents, like the 1984 Bhopal Union Carbide chemical cloud, which killed 2,500 immediately and an estimated 16,000 in the years following, prove the scale of devastation inherent in a chemical plant attack. Biological weapons are, like their chemical cousins, considered particularly insidious modes of harm against populations. They have considerable psychological impact, both in the abstract, and, in many cases, literally. Toxins, bacteria, and other pathogenic substances can all be used to target massive groups of vulnerable people; The stories through history of how biological weapons have been tested, and who upon, are the stuff of horror. Where certain bacteria are more effective to deliver, the weaponized virus is a highly particular threat that comes with greatly elevated risks. Yellow Fever, Marburg, Ebola, Rift Valley Fever and Japanese Encephalitis have all been weaponized. Ebola is a potential biological weapon, along with Anthrax and Plague. A scientist in possession of the Smallpox sequence (which is widely available), a gene synthesizer, and sufficient monetary and intellectual resources, could recreate that disease, or, for example, polio. From a logistical standpoint, viruses are surprisingly easy to synthesize but difficult to control once they've been released. This is a deadly weapon that recombines, self-perpetuates, mutates, and can jump from host to host, even species to species, with relative agility. A synthetic virus could be a special designer model, a monstrous recombinant of various strains. Another possibility is the stealth virus, which enters the body dormant and becomes active over time, crippling an individual or population slowly. Woodard notes that natural disaster is typically left out of popular postapocalyptic accounts because it is quite difficult to shape into a cohesive narrative. The weaponized or biological ends described above place us in sharp relief against known geopolitical powers. Greed, corruption and, often, sheer ineptitude are not only less cinematic but harder to quantify when it comes to the tangled and unpredictable chain of events precipitating a major environmental debacle like Deepwater Horizon or Exxon-Valdez, Chernobyl or Fukushima. Man-made ecological disasters are, however, the more plausible risk—far more likely to occur than a re-emergent Smallpox epidemic or a nuclear submarine launch. Though glaciers melting and wells drying up don't register as catastrophic in our everyday perceptions, on a wider time-scale, they are. Climate change is the grandfather of all ecological disaster, and it is widely accepted to be the cause of a rise in the frequency, intensity, duration, and occurrence of extreme weather events to come. As long as economies remain based on heavy consumption and high energy input, resulting in the warming of the world's atmosphere and oceans, snow and ice will continue to melt and water will keep rising. Global climactic shifts will impact both the approximately 2.6 billion people who depend directly on agriculture for their livelihood and the more than a billion people living in coastal cities that need to prepare vigorously for climbing sea levels. In 2012, Hurricane Sandy leveled New York and parts of New Jersey. Sandy was a tropical cyclone of grotesque proportions, creating over $60 billion in damage. That same year, 2,000 people died in the wake of Typhoon Bopha in the Philippines. As the ocean surface heats up, winds at lower altitudes are stirred and energized, creating cyclones, hurricanes, and typhoons. These events are becoming more violent and intense due to a complex matrix of factors that doubtless includes human interventions. The warmer atmosphere makes for more rainfall, which make for landslides all across the world. Man-made versions of this geological event are also triggered by misplaced irrigation, city building, and crop growing on vulnerable land, and deforestation, which loosens the soil. Natural gas-drilling makes for an even more terrifying phenomenon—the mud volcano—in which inhabited swathes of land are buried in hot torrents of liquified soil. Indeed, many ecological disasters are rarely ever purely natural: they can be a confluence of governance failures and fragile infrastructure intersecting with a horrendous weather event. The 2013 floods in the Himalayan state of Uttarakhand were technically caused by glacier lake outburst floods, in turn caused by climate change-induced glacier melting, but the floodwaters carried many thousands tons of debris and salt from hydroelectric dam building, which itself had completely destabilized the ecology of the area. The waters—again, from a glacier exploding—buried homes built on technically uninhabitable land. The 2014 floods in Kashmir made millions homeless; experts say they emerged from a combination of severe rainfall, mismanaged drainage channels, resource misallocation and poor planning. Fracking, or hydraulic fracturing, has been making the news lately too. Our burning need to pump its waste water underground—right into gas and oil formations—is causing more and more earthquakes. The areas around Dallas have been experiencing an increase fluid-injection tremors this year, leading to calls for the regulation of oil and gas drilling. Woe. Rivka Galchen’s New Yorker piece on fracking-related earthquakes is good on-the-ground reporting. In the next 85 years, extreme droughts are expected to affect 30% of the Earth’s surface. As Daniel noted, technology can be harnessed to reverse risks, and in the case of land use, to correct unsustainable farming, mining and overgrazing. Desertification, for instance, can be fought with better data about crop yields, soil productivity, rainfall and weather conditions. Several years ago, a drought in Russia was paired with hundreds of wildfires, forcing officials to grapple with the demands of extreme weather events. Even as Putin rejected support of the Kyoto Protocol, many Russian cities were blanketed in smog from the blazes, causing a spike in mortality rates. As of the end of June of this year, about 14% of the United States is suffering severe to extreme drought. The situation in California, for example, has had ripples of impact across the country. Attendant to the catastrophe are wild, intense and uncontrollable forest fires, together called the Rocky Fire. Firefighters have been quoted as saying that fuel and timber are burning so rapidly that they simply cannot keep up. Of all the possible scenarios outlined here, there may not be a more potent or more ancient image of mass destruction than fire, consuming the horizon.